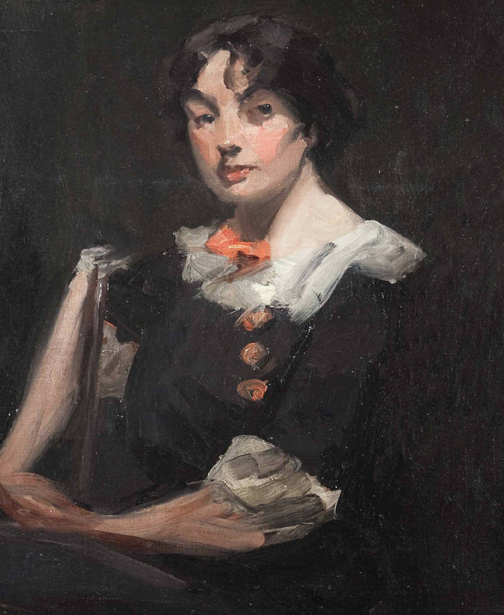 "Study Portrait of a Woman," by painter George Luks, is the subject of Tyler Art Gallery Assistant Director Michael Flanagan's free talk at 12:30 p.m. July 14 at Oswego State Downtown. OSWEGO — Michael Flanagan, assistant director of SUNY Oswego’s Tyler Art Gallery, will speak Wednesday, July 14, about American painter George Luks, whose “Study Portrait of a Woman” is on display in poster-style print form at Oswego State Downtown. Flanagan’s free luncheon talk will take place at 12:30 p.m. at Oswego State Downtown, corner of West First and Bridge streets in Oswego. Luks (1867-1933) exemplified what the Whitney Museum dubbed the New York Realists school of the early 20th century. He often depicted working-class people in unidealized moments of their lives, a controversial preoccupation in an era when many other artists focused on socialites and the rest of the upper-crust world. SUNY Oswego’s permanent collection includes “Study Portrait of a Woman” and the eight other pieces depicted in poster-style prints, which can be viewed and ordered for purchase at Oswego State Downtown’s exhibit through July 24. Oswego State Downtown, an arm of the College Book Store, is open noon to 5 p.m. Wednesdays, 10 a.m. to 8 p.m. Thursdays, 10 a.m. to 5 p.m. Fridays and 11 a.m. to 5 p.m. Saturdays. Call 216-4985 for more information.